St. Mary School in New Richmond, Wisconsin marked its 125th anniversary on June 25th, 2015. The school was started by Father Walter Fardy. He was responsible for designing and building the first parochial school building in New Richmond. He drew plans for a 46 x 50 foot stone basement, with a two story structure to be erected. The walls were to be of solid brick with a mansard roof with a deck of tar and gravel. It was to have a belfry and a spire. There were two classrooms on the first floor; one classroom, a music room and a laboratory on the second floor. The school was practically hand-built by Father Fardy and his parishioners. Work began on June 25, 1890 and the construction was completed early in 1891. 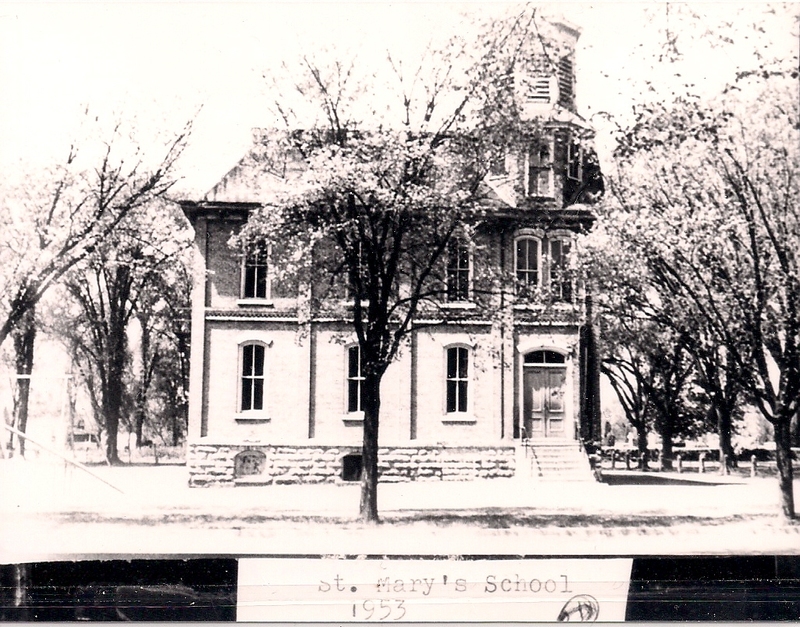 St. Mary’s was established as an elementary school and a high school academy. In 1894, a class of four graduated from St. Mary’s Academy. A book, The Catholic Church in Wisconsin, published in 1986, stated that the parish of Immaculate Conception had a parochial school with an enrollment of 120 pupils. Both St. Mary School and the public school survived the cyclone of June 12, 1899. The Sisters of St. Agnes of Fond du Lac arrived in September of 1906. The brick rectory between the school and the church was turned over to the nuns as a convent. They taught at St. Mary’s from 1906 to 1920. St. Mary’s was used to teach Irish history. In the fall of 1926, seven Benedictine nuns from St. Joseph, Minnesota served St. Mary’s from 1926-1928. Father Patrick Mahoney came to New Richmond in 1927, and for the fall of 1928, secured the Sisters of St. Joseph of Nazareth on the Lake from Superior, Wisconsin. For the next fifty-three years, the Sisters from this order served St. Mary School. By the 1950’s, the old school was quickly falling into disrepair. The enrollment had climbed to over 250 students in a building built for 120 students. The old school was torn down in 1953. Ground was broken for the new school and convent in 1953. The class of 1955 was the first class to graduate from the new school. In 1973, the Knights of Columbus renovated the second floor. They have continued to support St. Mary School in many ways, including contributing funds to help the athletic program and scholarship fund. In 2003, the school was remodeled and an addition was built. Over the years, St. Mary School has strived to fulfill the school’s mission to “Grow in Knowledge, Follow in Faith, and Serve in Harmony”. The students score higher on average than the national norms. New Richmond High School statistics show that 25% of valedictorians and salutatorians from 1945-2015 were St. Mary School alumni, most recently in 2002, 2010 and 2015. Students and staff participate in community service projects, go to weekly Mass and participate in the music ministry at Sunday Mass throughout the year. It has grown to include not only Kindergarten through 8th grade, but also Pre-school and 4YK charter classes. In the past 125, over 2000 students have walked through the doors of St. Mary School and have received an outstanding education, increased their faith and learned to give back to their community through the school’s many years of dedication to excellence and tradition.